A few months ago, I vowed to eat more desserts. My first week I made an amazing pineapple and rhubarb crumble. It was delicious, but it made me realize something. Crumble is best with ice cream. Yes, the dairy-free girl said that. I missed the ice cream. I tried making some non-dairy versions, but it was too much work. Believe it or not, I am a very lazy person when it comes to cooking. After that I was at a standstill. Not wanting to using dairy limited me on one side, and Manatee’s resistance to gluten limited me on the other side. I was stuck in the too-healthy middle. I wanted sweets, but how could I satisfy my sweet tooth? It was then I realized I need to re-think desserts. As I was sitting on the couch craving something sweet, Manatee went for his nightly popsicle. 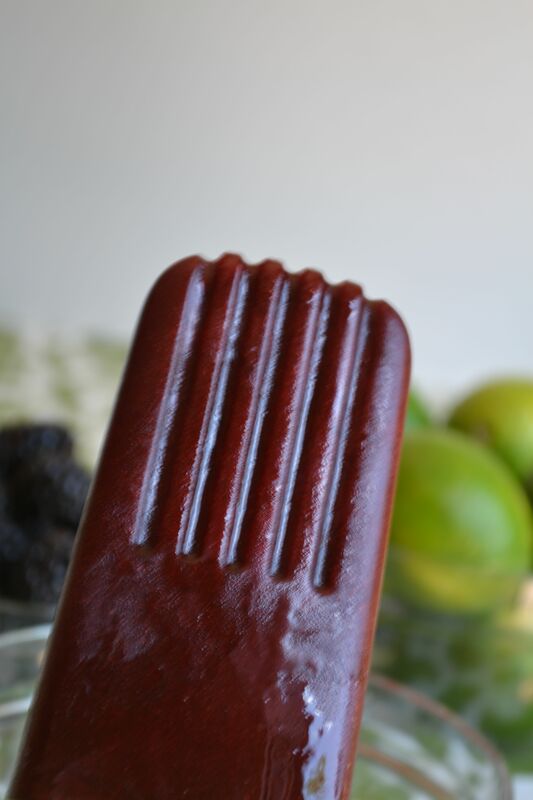 Yes, even the clean Manatee has his kryptonite: sugar-free popsicles. I could solve my dessert dilemma and help Manatee overcome his last non-clean habit: I would make my own popsicles. I started doing research and was dismayed that many of popsicles on the internet involved dairy in some form. It couldn’t take longer than mixing together a batch of cookies. Ideally, it should be less work. It needed to have a minimum number of ingredients, focusing on fresh produce. It needed to contain as little sugar as possible, preferably it should use agave nectar and that should also be kept to a minimum. 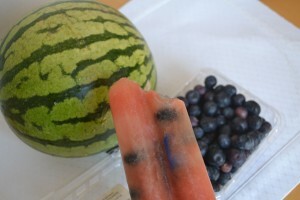 I started with watermelon and blueberry popsicles. They satisfied my need for sweet but didn’t have the texture of popular processed versions. I talked around and did some research on homemade popsicles in general. 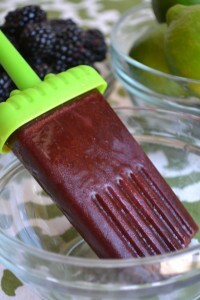 To get a smoother texture, I would need to strain the fruit. All recipes seem to call for a sweet fruit, water, an acidic element, and sugar in some form. Not happy with any existing recipes, I cobbled together my own. 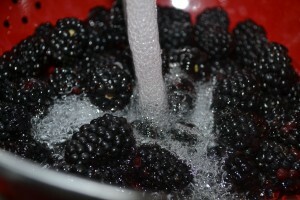 I decided to focus on my efforts on blackberries. I knew I also wanted to use limes and agave nectar. 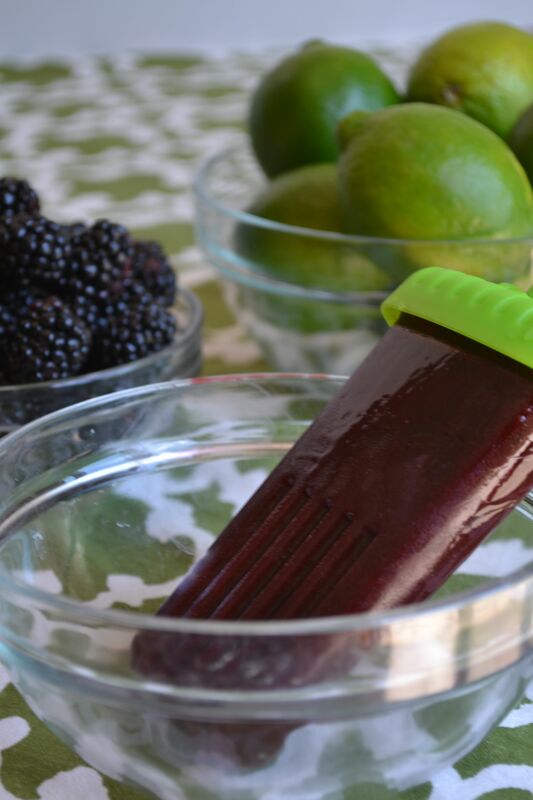 The result was a smooth and tangy homemade ice pop that will refresh and nourish your body. 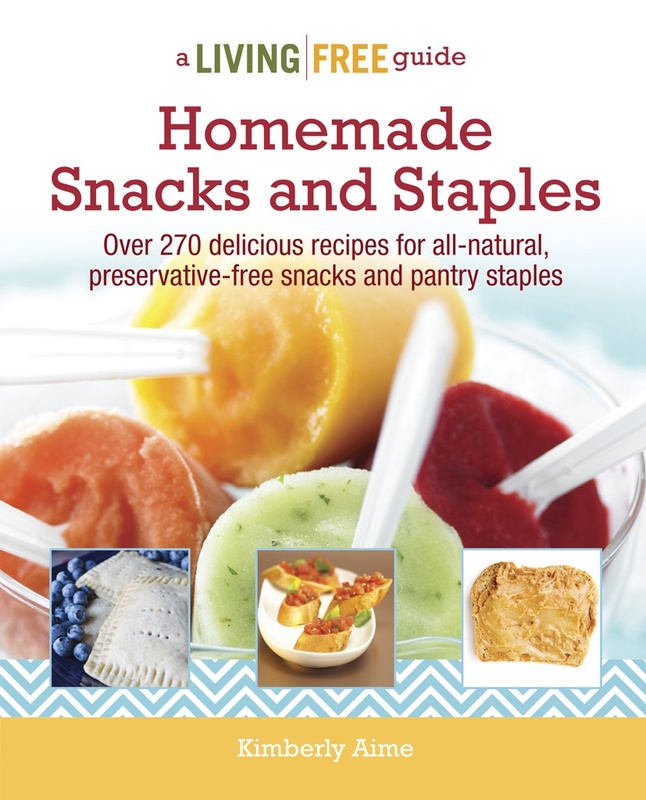 Great for summer snacks, weekend treats, and especially for dessert on warm summer nights. 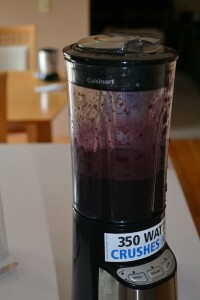 Puree the berries in the blender. Using a fine mesh strainer or chinois, strain the berries into a medium sized bowl. Whisk together the berries, lime juice, water, and agave nectar. It should taste a little too sweet because you will lose some sweetness in freezing. 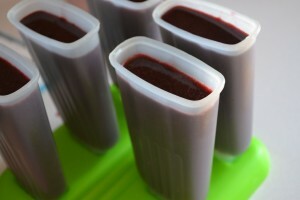 Pour berry mixture into popsicle molds. Make sure to leave a 1/4 inch space at the top of the mold to allow for expansion. Blackberries can stain. Don’t be like me and wear a white shirt when making them. Yes, there was a reason, I didn’t photograph every step of the process and why I will no longer be wearing that shirt. Straining is optional. It really doesn’t take that long, but if you like blackberry seeds, leave them in. It will make for a more rustic pop. If straining, make sure to really push down on the berries as you strain. This allows you to get more juice for your buck. I felt like cheering when I took my first bite. 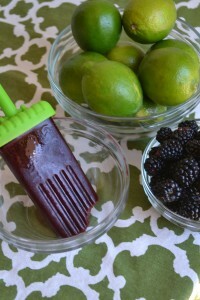 The texture was smooth and the flavor was sweet blackberry with a slight lime tang. All natural, all good for you, all refreshing. Even with straining, they didn’t take long to make. Manatee was even impressed. And with popsicles, that takes a lot. I am also proud of how much sugar I cut out. Most recipes call for 1/2 to 2/3 cups of sugar. I got out with just 3 tablespoons of agave nectar. Yes, I think we can call this recipe a success in my book. Now, if you don’t mind, I have some popsicles to eat. Unlike cookies, these babies melt. What are your favorite summer treats? Any flavor requests for round 3 of popsicle making? 140 Comments on "Blackberry and Lime Homemade Popsicles"
You made a great-looking dessert considering the restrictions. 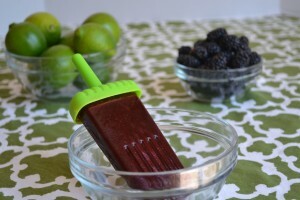 I’ve always wanted to make margarita-flavored popsicles for some reason. 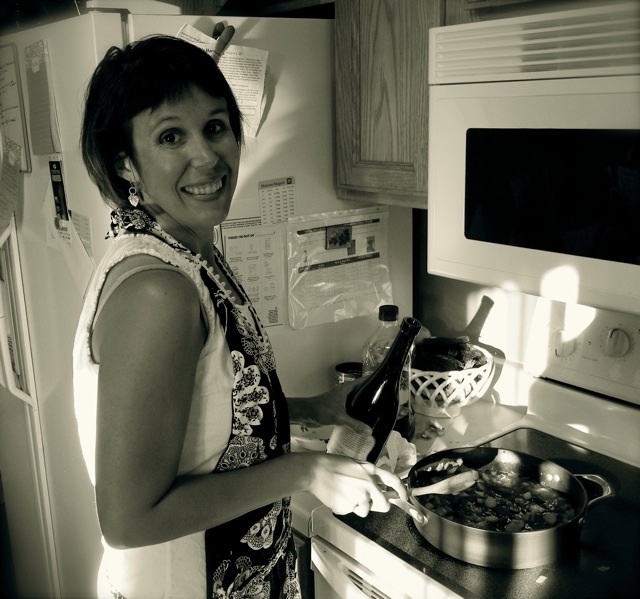 Cucina49 recently posted..Wherefore Art Thou, Dinner? Your popsicles are so refreshing and delicious looking with those fresh blackberries! The perfect treat for a hot day. I just want to mention I am all new to blogs and really loved you’re blog site. Likely I’m planning to bookmark your blog . You absolutely have incredible writings. Cheers for revealing your blog. That is the suitable weblog for anyone who desires to search out out about this topic. You realize a lot its virtually arduous to argue with you (not that I actually would want…HaHa). You undoubtedly put a brand new spin on a topic thats been written about for years. Nice stuff, just nice! hello!,I like your writing very much! percentage we keep up a correspondence extra about your post on AOL? I need an expert in this space to unravel my problem. Maybe that’s you! Having a look forward to look you. I am also commenting to let you be aware of what a superb discovery my daughter experienced browsing your web site. She came to understand a good number of things, which included how it is like to have an amazing teaching mood to have the others completely know just exactly certain complex issues. You truly did more than her desires. Many thanks for coming up with those insightful, safe, explanatory and as well as cool guidance on that topic to Kate. qifxovyrzh Adidas Yeezy,If you are going for best contents like I do, just go to see this web page daily because it offers quality contents, thanks! whoah this blog is great i like studying your articles. Keep up the great paintings! You realize, many persons are searching round for this information, you can help them greatly. cxuwdk,If you are going for best contents like I do, just go to see this web page daily because it offers quality contents, thanks! Thanks , I’ve recently been looking for info approximately this topic for ages and yours is the greatest I have discovered so far. But, what about the bottom line? Are you positive about the supply? I’ve been browsing online more than three hours these days, yet I never discovered any attention-grabbing article like yours. It¡¦s beautiful price sufficient for me. In my view, if all web owners and bloggers made excellent content material as you probably did, the net shall be much more useful than ever before. You actually make it seem so easy together with your presentation but I in finding this topic to be really one thing which I believe I might never understand. It sort of feels too complex and very large for me. I’m looking ahead on your subsequent publish, I¡¦ll attempt to get the dangle of it! I have to express my gratitude for your kindness for those who really want guidance on this important area of interest. Your very own dedication to getting the solution throughout had become remarkably valuable and have continually made some individuals just like me to attain their aims. Your helpful guidelines can mean so much to me and still more to my colleagues. Many thanks; from everyone of us. xjctpevr,Wonderful one thank you so much ! Hiya, I’m really glad I’ve found this info. Nowadays bloggers publish just about gossips and web and this is actually irritating. A good website with exciting content, this is what I need. Thanks for keeping this web site, I’ll be visiting it. Do you do newsletters? Can’t find it. sgjbbqqcskx,We have a team of experts who could get you the correct settings for Bellsouth net email login through which, you can easily configure your email account with MS Outlook. yrizlms,A very good informative article. I’ve bookmarked your website and will be checking back in future! I would like to show some appreciation to the writer for bailing me out of this type of problem. Right after browsing through the the net and getting proposals that were not productive, I thought my entire life was done. Being alive devoid of the solutions to the difficulties you have solved as a result of your website is a serious case, and those which may have adversely affected my career if I hadn’t noticed your web blog. Your own personal understanding and kindness in touching all areas was very helpful. I don’t know what I would have done if I had not discovered such a subject like this. I am able to at this time relish my future. Thanks so much for this skilled and results-oriented guide. I won’t be reluctant to suggest the blog to anybody who needs and wants recommendations about this matter. Thank you for any other great article. The place else may just anyone get that type of information in such a perfect method of writing? I have a presentation subsequent week, and I’m at the look for such information. vrjwsn Yeezy 2019,Very helpful and best artical information Thanks For sharing. I¡¦ve read some good stuff here. Certainly worth bookmarking for revisiting. I wonder how much effort you put to create this sort of wonderful informative website. Thanks a bunch for sharing this with all of us you really understand what you’re talking approximately! Bookmarked. Please also discuss with my website =). We will have a link trade agreement among us! nlr3OG I went over this internet site and I believe you have a lot of good information, saved to my bookmarks (:. it is something to do with Lady gaga! Your individual stuffs nice. I wonder how so much attempt you place to create one of these excellent informative website. concerning this weblog, this weblog is genuinely remarkable. Hello to every single one, it’s in fact a fastidious for me to visit this web page, it contains important Information. I go to see everyday a few web sites and websites to read posts, except this weblog gives quality based content. to and you’re just extremely great. I actually like what you’ve bought here, really like what you’re saying and the way in which you are saying it. I’m quite certain I’ll learn plenty of new stuff proper here! and we are looking to exchange strategies with other folks, be sure to shoot me an e-mail if interested.